Winston's rescue was my most challenging yet, not because he was uncooperative, but because he chose to climb into a dead and decaying tree. Luckily there was a healthy tree growing 10-15 feet from his dead tree that I could climb instead of trusting my life entirely to the dead one. 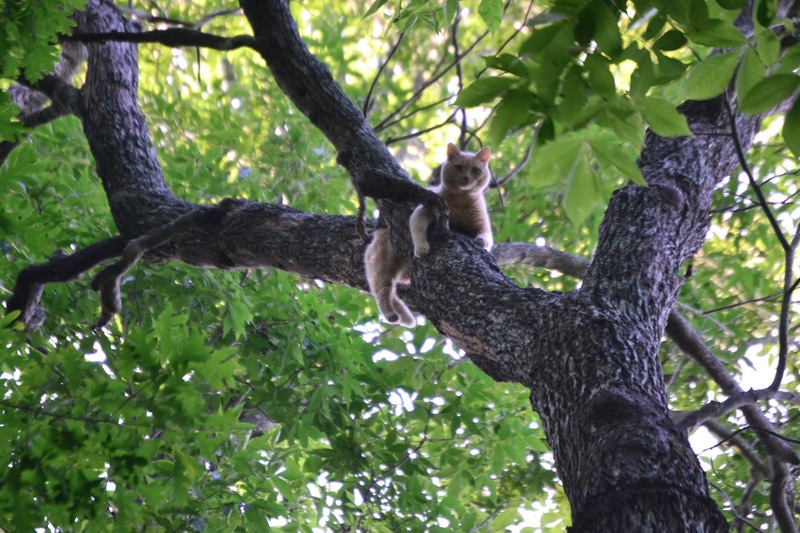 The rescue came on Winston's fourth day in the tree. The weather conditions each day of Winston's ordeal had been scorching sun and highs in the upper 80's. When I got to him he was the weakest I have ever seen a cat. He was lethargic and clearly dehydrated. He would let out a few cries and then drift into a motionless slumber draped over the crotch of the tree. I know cats are tenacious but I don't know how much longer Winston could have held on. 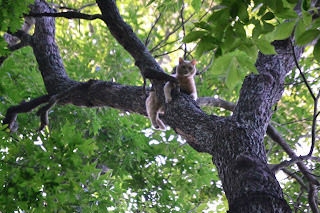 I climbed the healthy hickory tree to about 50 feet and traversed from that tree to Winston's tree. Near the end of the rescue I had no choice but to trust nearly all of my weight to the dead, wood pecker-riddled, and creaking tree. I was still tied into the hickory tree in case Winston's tree began to crack. Fortunately, it held and I was able to pick Winston off his perch and get him into the rescue bag. He made absolutely no attempt to resist and nearly an hour and a quarter after I arrived Winston was back inside his home lapping up some much needed hydration. Thank you to Winston's family for the pre-rescue picture.